Tattoos have been applied to human skin for thousands of years. In 12,000 B.C. ash rubbed into skin cuts at bereavement ceremonies. Tattoo pigment bowls and needles have been found in Western Europe dating back to 8,000 B.C. Egyptian mummies have been found dating back to 4,000 B.C. that have tattoos as well as evidence of attempted removal. In 543 A.D. the Greek Aetius first documented the attempt at tattoo removal using salabrasion (abrasion of the skin with salt). In modern western cultures tattoos can be barriers to employment, perceived as antisocial or aggressive behavior or signs of immaturity, rebellious behavior or inability to accept authority. Over time the tattoo ink particles move deeper into skin and become duller, indistinct and blurred. Older tattoos are harder to remove in part because the ink particles move deeper into the skin over time. The ink depth and density is highly variable within a tattoo i.e. tattoos are not uniform. In the late 1970s laser tattoo removal appeared on the scene after different wavelength lasers became available and it was shown that the tattoo inks selectively reflected or absorbed different wavelengths of light. The selective heating of the ink over adjacent skin cells by the laser broke up the ink particles and allowed cells within the skin to remove these smaller ink particles. In 1983 Reit et al described the use of shorter laser pulse duration using a Q-switch (nanoseconds rather microseconds) resulted in less surrounding tissue damage, multiple lesser treatments gave better results than single large treatments and the need to space treatments 3 or more weeks apart to allow for tissue recovery between treatments and pigment removal by skin cells. Black and red inks absorb the wavelength of light emitted by the Q-switch laser better than other colors. 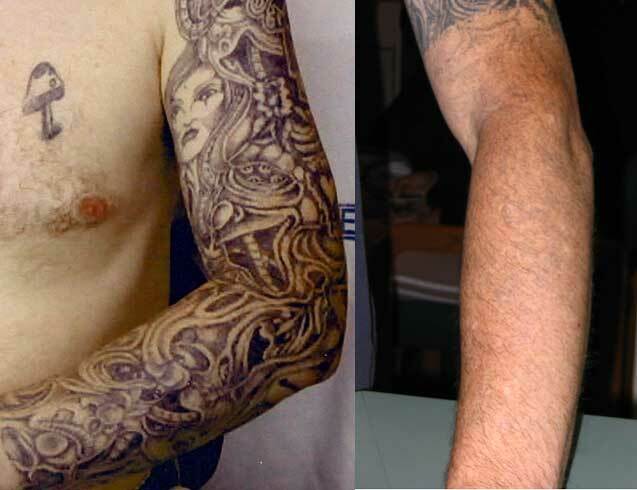 Removal of a larger than 12inch arm tattoo using a Q-switched Nd/Yag laser. Currently as many as 22% of U.S. college students have at least one tattoo and about half of people who get tattoos later try to have them removed. A new study from a laser-surgery center in Milan, Italy, looked at 352 patients treated from 1995 through 2010. They found that tattoo removal is less likely to succeed if the person is a smoker, the design contains colors such as blue or yellow and the tattoo was larger than 12 inches. Smoking reduced by 70% the chance of successfully removing a tattoo after 10 treatment sessions. Smoking is believed to hinder tattoo removal because smoking is known to hinder wound healing. 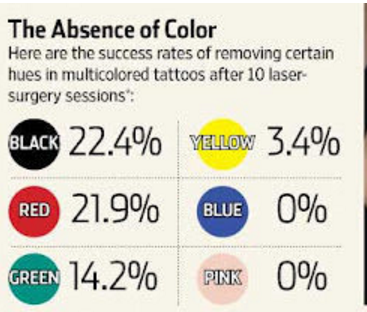 Overall, the study found about 47% of people had their tattoos successfully removed after 10 laser treatments and it took 15 treatments to remove tattoos from 75% of patients. The researchers also found that the amount of time between Q-switch laser treatment sessions was important to the technique’s success. Treatment intervals of eight weeks or less were found to be less effective for tattoo removal so waiting more than 2 months between treatment sessions is a good idea. A separate study, also published in the Archives of Dermatology, however, suggests a different type of laser currently in development called a picosecond alexandrite laser, can remove tattoos with fewer treatments than the Q-switch laser. No word yet as to when this will be commercially available. A small number of cases from Europe have been reported of missed melanoma skin cancers due to adjacent or overlying colored tattoos. The cancer may be even harder to diagnose after it meets the light of a tattoo removal laser. It is now recommended that tattoos should never be placed on pigmented skin lesions or moles and if they are, they should not be treated by laser.